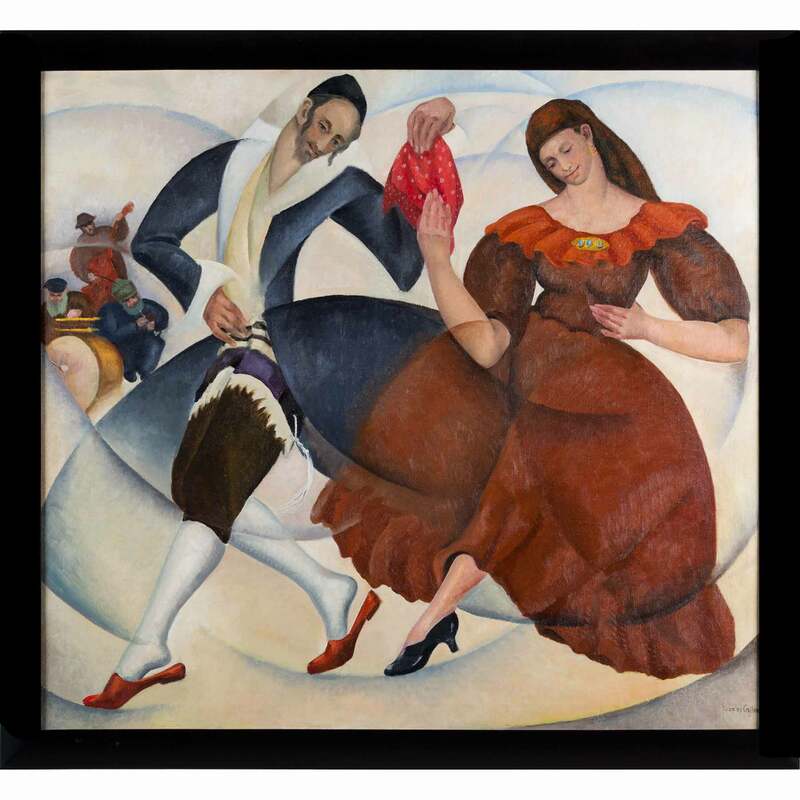 In this dynamic canvas, Chicago artist Todros Geller paints a traditional Hassidic wedding dance in a modern style influenced by French Cubism and Italian Futurism. 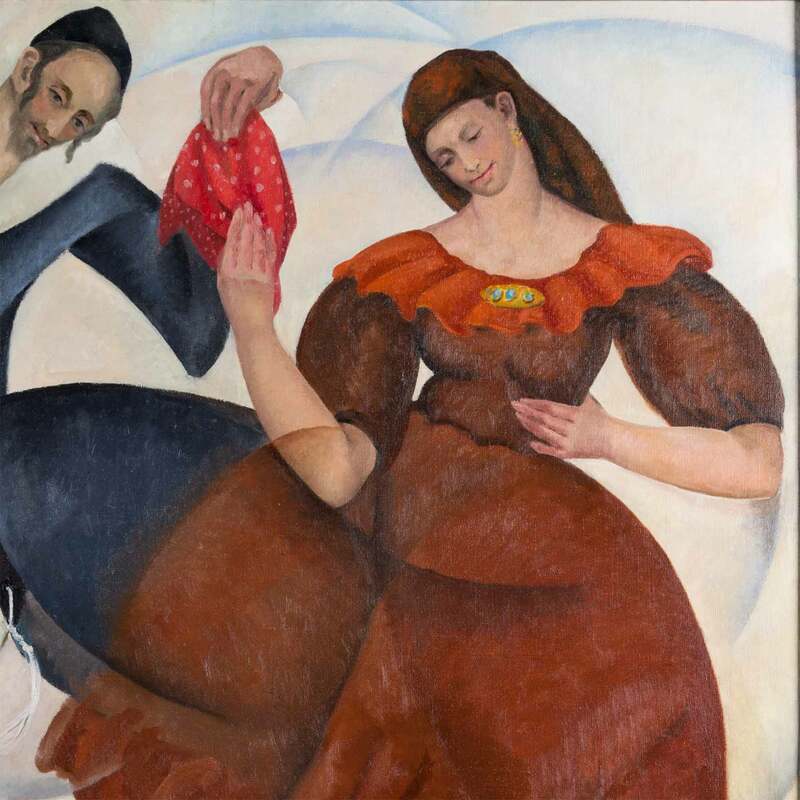 In 1918, Ukrainian-born painter Todros Geller settled in Chicago, where he became an influential artist, a passionate educator, and a tireless promoter of Jewish art. Known as the "Dean of Chicago's Jewish artists," he organized fellow modernists such as Aaron Bohrod and Mitchell Siporin into a Jewish artists' club called Around the Palette (predecesssor to the American Jewish Artists Club). Geller became well-known for his woodcut prints, which were exhibited at The Art Institute of Chicago, appeared in Jewish periodicals and books, and even graced the covers of Jewish New Year cards. According to one report, there was a time when a Todros Geller print hung in almost every Jewish living room in Chicago. In the 1920s, Geller visited British-controlled Palestine in the hope of discovering an indigenous Jewish folk art tradition. 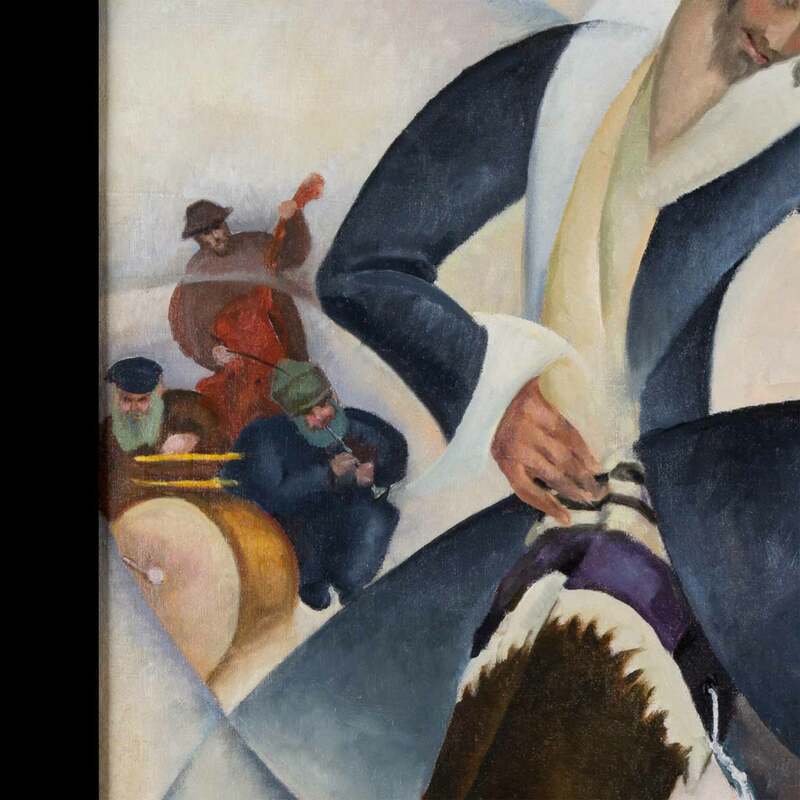 He did not find what he sought; however, the trip offered rich material for subsequent work and inspired a series of paintings portraying Hassidic life and folk culture. This newly restored painting depicts a couple's first dance after their wedding ceremony. 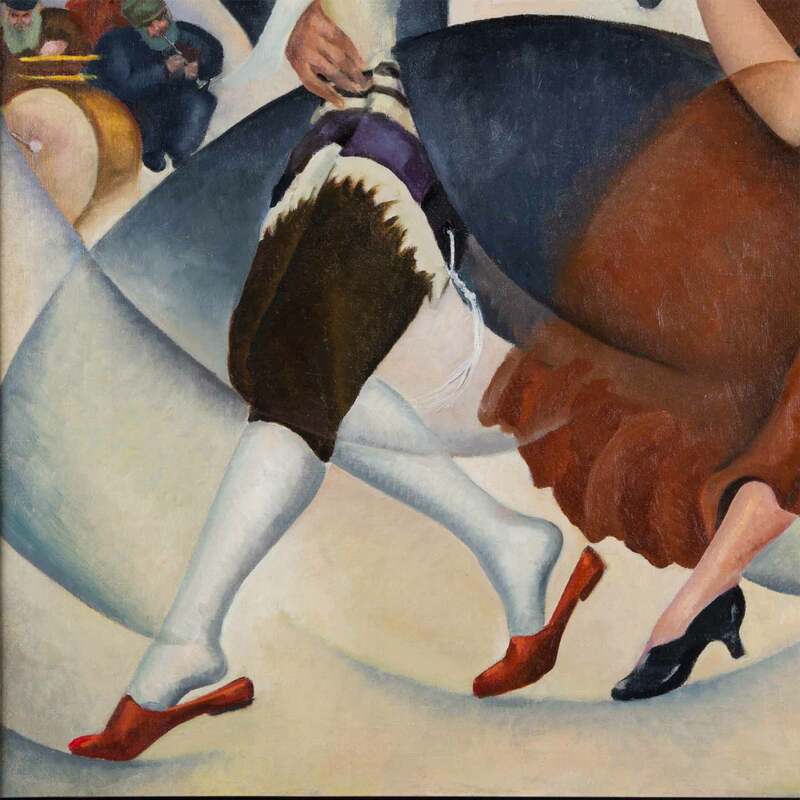 The traditional subject of the Hassidic Mitzvah Tanz is rendered in a modernist style with geometric, fragmented forms inspired by French Cubism and a sense of swirling, rushing movement borrowed from Italian Futurism. Spertus Institute is proud to house the Todros Geller archive, consisting of 3,245 items from the artist’s estate including paintings, drawings, prints, printing blocks, bookplates, limited edition monographs, correspondence, and teaching materials. In this signature image Todros Geller pictures himself as a goat sitting on the shore of Lake Michigan with Chicago’s skyline in the background. 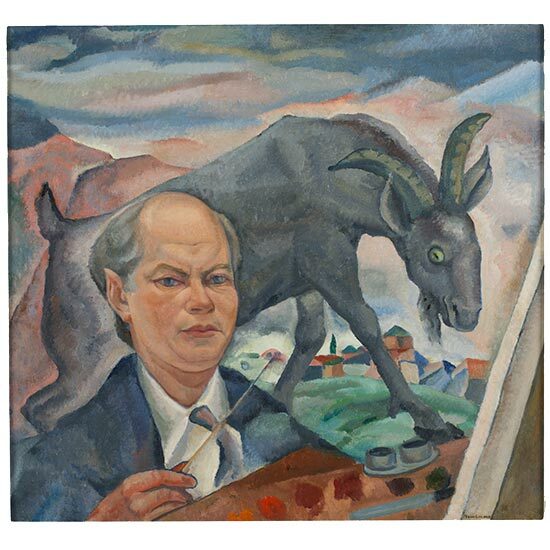 The goat, an important staple of Jewish life in Eastern Europe, became Geller’s personal motif and reflected his status as a hardy transplant from the European countryside to an American city of steel and cement. 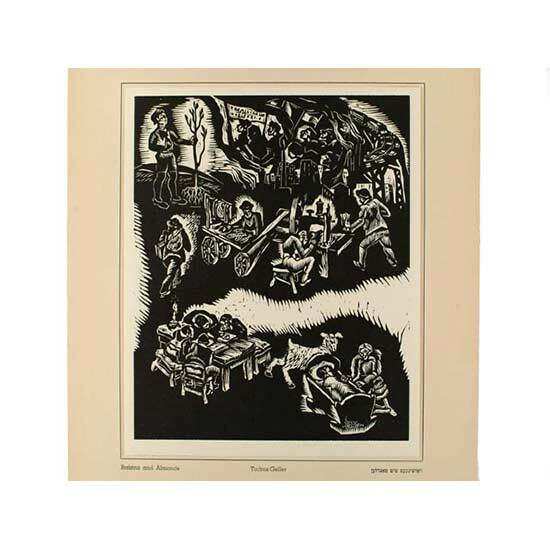 This print was part of portfolio of woodcuts created by a group of progressive Jewish artists in support of Biro-Bidjan, a Jewish autonomous region in the former Soviet Union. In the introduction to the portfolio, written in Yiddish and English, the artists expressed that their work emerged from a past rooted in age-old suffering but is energized by a new cultural force that aspires for a better life and a more understanding world. Raisins and Almonds is the title of a Yiddish poem and lullaby, written by Abraham Goldfaden in 1880. In this cycle, Geller shows a baby in a cradle, who grows into a Yeshiva student, then goes to work in a factory, emigrates to Chicago with its elevated train tracks, marches in demonstrations, and ultimately achieves renewal and transcendence as he stands grasping a sapling. In the 1920s and early '30s, Geller produced many images of traditional Jewish life and culture. 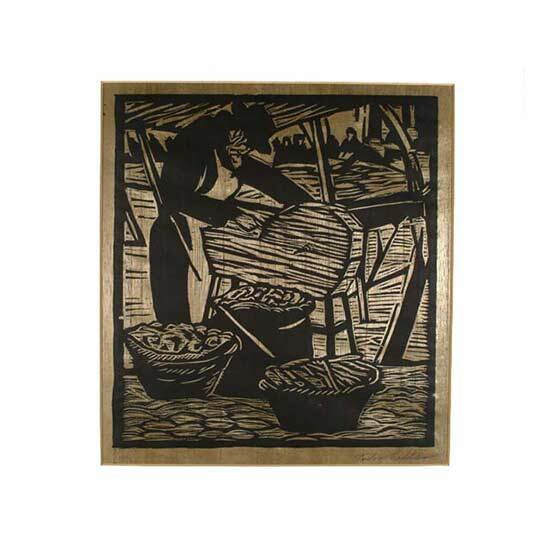 This woodcut shows a horseradish grinder on Chicago’s Maxwell Street who is wearing traditional Orthodox garb. According to his publisher and patron, L.M. 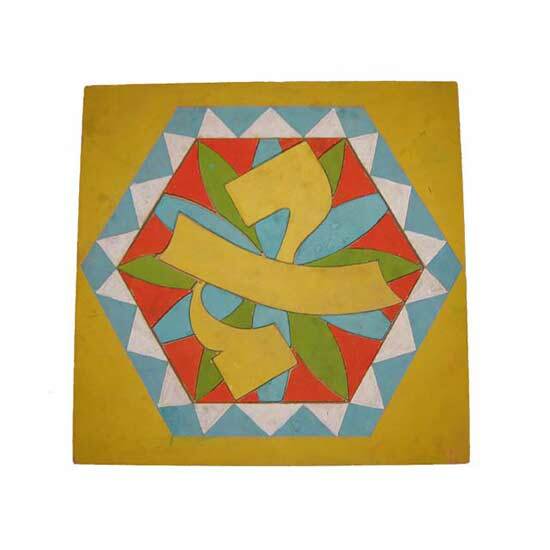 Shteyn, Geller strove to create a new Jewish aesthetic that he called “Modern Folk Art.” This image appeared in Yiddishe Motivn (Jewish Motifs), one of four art albums published by Shteyn and devoted to Geller’s art. Todros Geller was regarded as a leader in the field of synagogue and religious art. 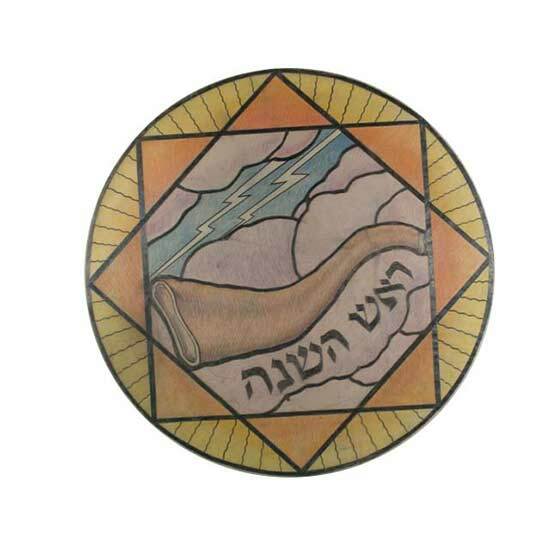 He designed stained glass windows for synagogues in Omaha, Fort Worth, Dayton, Stamford, and Chicago Heights. This is a drawing for one such commission. In addition to conducting classes in his studio, Geller directed art programs at the Jewish People’s Institute (JPI), the Board of Jewish Education, and the College of Jewish Studies (which became the Spertus Institute for Jewish Learning and Leadership). Many prominent Chicago artists studied drawing and painting under Geller and were inspired by his vision. Dimensions: 45 x 41 in.